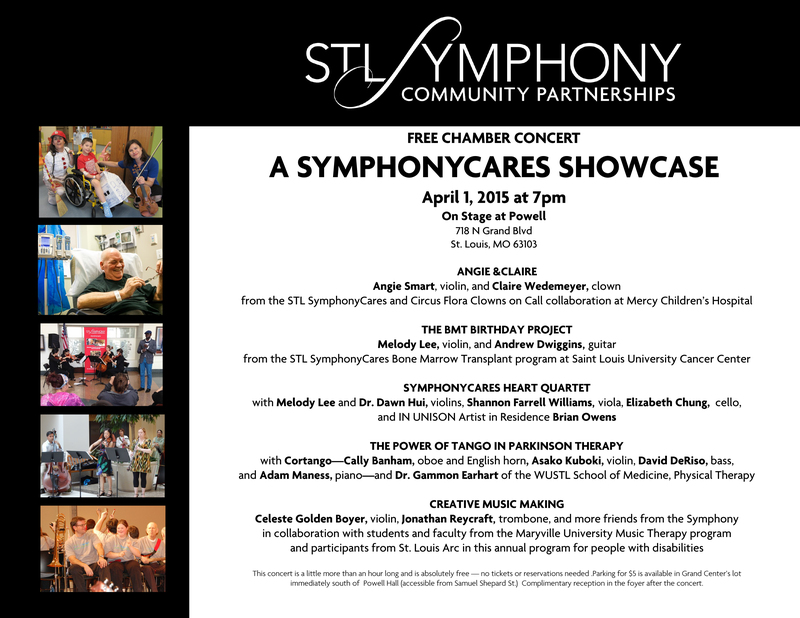 April 1st : SymphonyCares Showcase : Featuring the SLU Cancer Center! 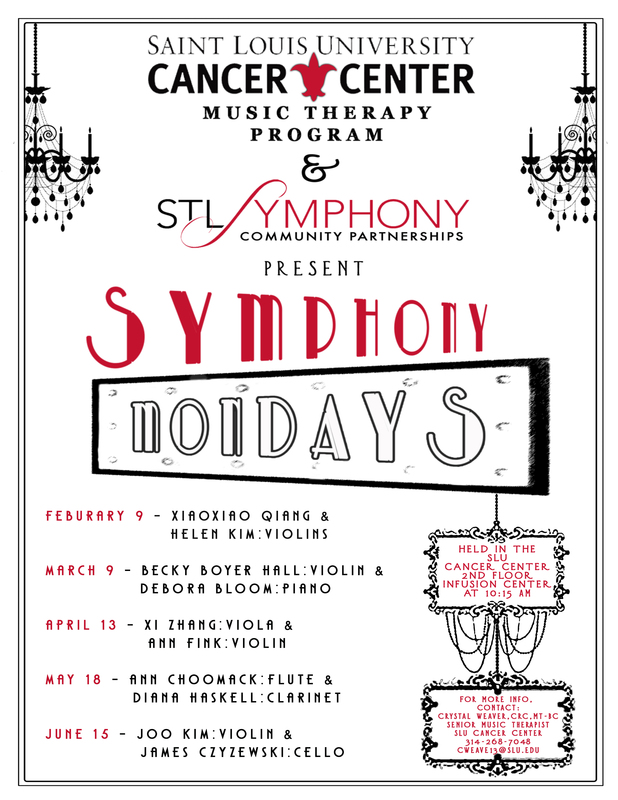 We are thrilled to be apart of the St Louis Symphony’s ‘SymphonyCares Showcase’ this year! They will highlight their outreach efforts in different community settings, and part of the event will recreate the ‘Day Zero’ performance of Van Morrison’s “Into the Mystic” that two wonderful Symphony musicians gave at our BMT Clinic last December. —- Tickets are FREE! —– Come and enjoy some excellent music and see how the St Louis Symphony impacts our community in amazing and meaningful ways. This entry was posted in Andrew's Highlights, Crystal's Corner, Symphony Mondays, What's New and tagged Crystal Weaver, Guitar, Mark Varvares, Maryville University, Music Therapy, Saint Louis Symphony, Saint Louis University BMT Clinic, Scott Fosko, SLU Cancer Center, SLU Cancer Center Music Therapy Program, STLMTA, The League of American Orchestras, young adults. Click on the image below to read a fantastic article done by the St Louis Area Business Health Coalition on music therapy here at SLU! This entry was posted in Crystal's Corner, Developments in Music Therapy, What's New and tagged AMTA, cancer, CBMT, Chemotherapy, Chord progression, courageous coping, Crystal Weaver, Mark Varvares, Mental Health, Music, Music cognition, Music Therapy, Saint Louis Symphony, Saint Louis University BMT Clinic, Saint Louis University., SLU Cancer Center, STLMTA, The League of American Orchestras. We are thrilled to announce our newest season in partnership with the Saint Louis Symphony! Their fine musicians provide a welcome sensory refocus by performing cherished Classical selections for our patients in the outpatient Infusion Room. To say we are lucky to have them would be like saying “the ocean is wet” – an understatement! This entry was posted in About Us, Andrew's Highlights, Crystal's Corner, Symphony Mondays, What's New and tagged AMTA, cancer, CBMT, Chemotherapy, courageous coping, Crystal Weaver, Mark Varvares, Saint Louis Symphony, Saint Louis University., SLU Cancer Center, SLU Cancer Center Music Therapy Program, Stringed, The League of American Orchestras. It’s been a WHILE since I’ve posted a video on here, and I’M SORRY!!! Here’s a video that focuses on the importance of your rhythm hand, while teaching you the chords to an American pop classic – “Sittin’ on the Dock of the Bay”. This entry was posted in Andrew's Highlights, Andrew's Repertoire Builder, Vitamin G (for guitar) and tagged adolescents, AMTA, art, cancer, capo, CBMT, Chemotherapy, Children with Cancer, Chord, Chord progression, courageous coping, Education, Guitar, Health, Saint Louis University., SLU Cancer Center, SLU Cancer Center Music Therapy Program, STLMTA, The League of American Orchestras, Therapeutic Songwriting. The League of American Orchestras Getty Education and Community Investment Grant. 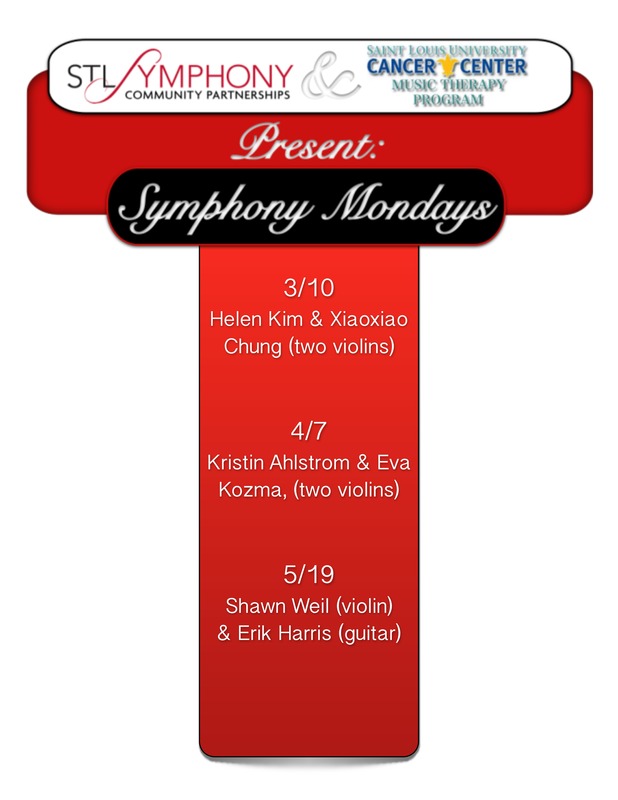 This entry was posted in Symphony Mondays, What's New and tagged AMTA, Music Therapy, Saint Louis Symphony, SLU Cancer Center, SLU Cancer Center Music Therapy Program, STLMTA, The League of American Orchestras.